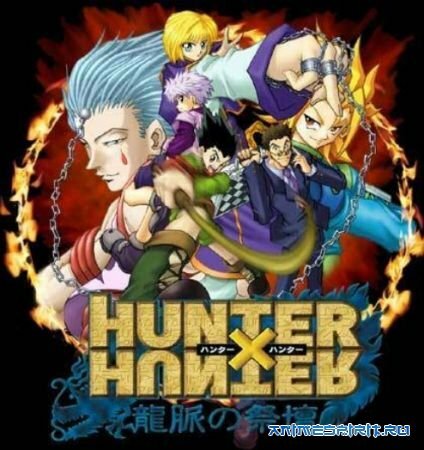 From the anime, Hunter x Hunter (1999)。The second opening to the show. Today’s Pokemon is Mawile –again! 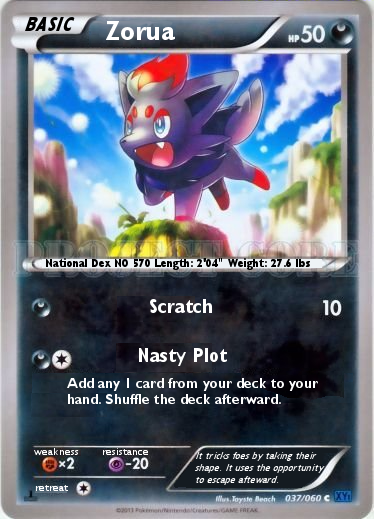 I translated one of the cards from a newer set a few days ago, so here is a slightly older one. Japanese Card is top/first, my edit/translation is second/bottom. Card info can be found here. A translation of the Intro/Opening song from one of my favorite anime, Angel Beats. There is a link to the song at the bottom of the page. Posted in Anime, Song Lyrics, Translation. Tagged angel beats, english, japanese, kanji, lia, lyrics, my soul, op, opening, romaji, tenshi, translation, your beats! Today’s Pokemon is Mawile. More information on the Pokemon can be found here. 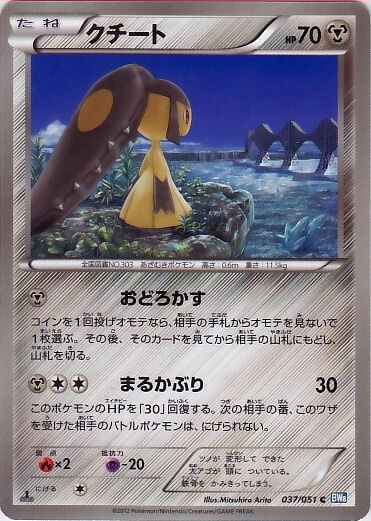 The original Japanese card is first/on top. My edit/translation is second/bottom. 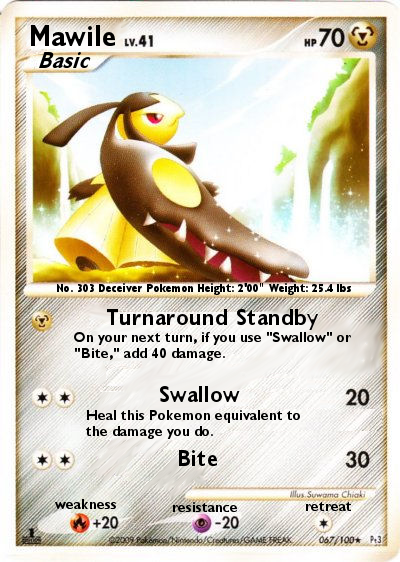 -The official Localization named the second move (Circle Head) to “Big Ol’Bite” to reference what the move does rather than what it refers to. 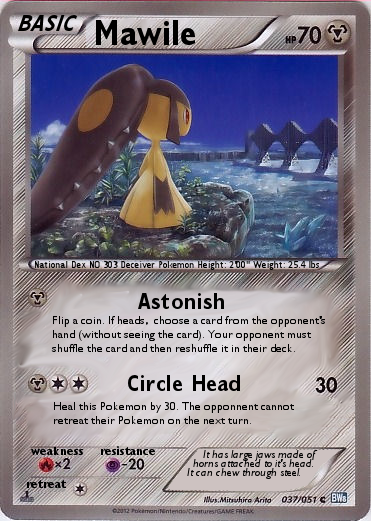 The “Circle Head” refers to the circle on the scary head attached to the Mawile (which has the yellow circle) –implying the bite. This would be hard to explain on the card itself given the room, so their decision was more friendly to younger audiences. 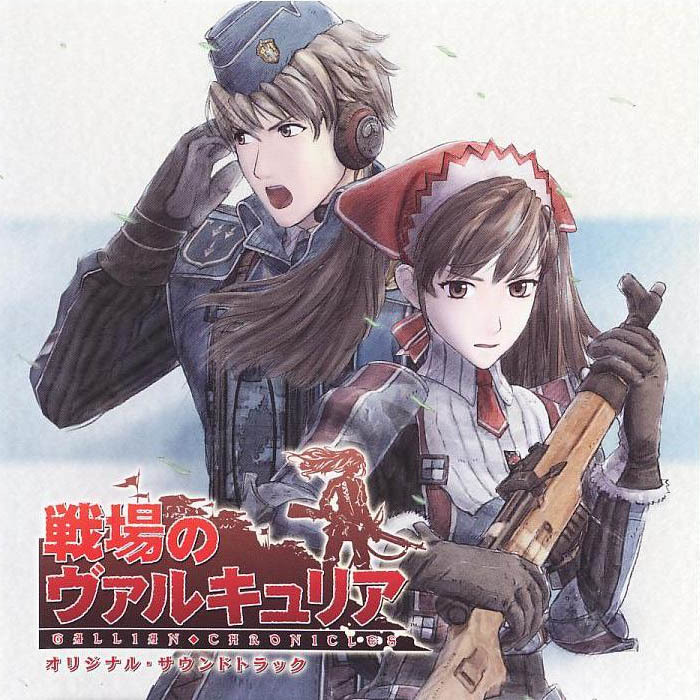 Today’s song is “One Wish”, by Inoue Hikari –used as the second Ending Theme for Valkyria Chronicles (the animation). I used the Video Game OST cover here, however. The game is one of my favorites, and not very many people have played it. The anime was not as good in my opinion. This way, you can read them/know the meaning all together. Color code should help you keep track. 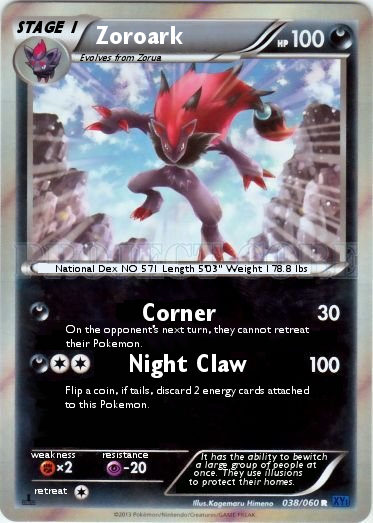 Today’s Pokemon card is Zoroark! More information and the source of the card can be found here. Original card is first/top, and my edit/translation is second/on the bottom. 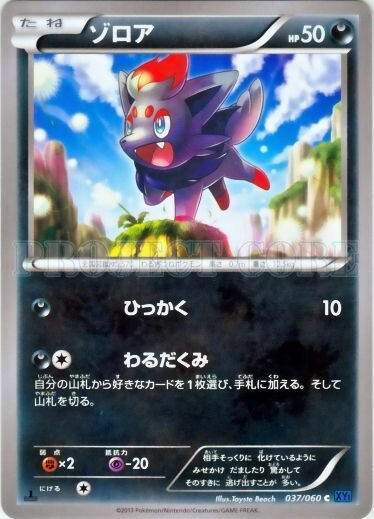 Today’s Pokemon is Zorua. The source of the card and more information about it can be found here. As usual, the first/top is the original Japanese card, and the second/bottom is my edit/translation.